The 4ALL residential drainage channel is manufactured from HDPE (High Density Polyethylene) and come complete with galvanised mild steel grating. 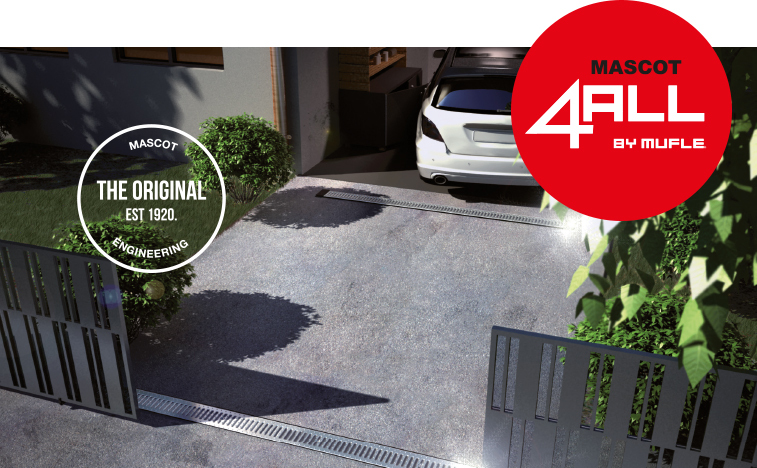 The DIY 4ALL is ideal for use around the home; driveways, patios and walkways. Plus, it’s simple and easy to install whilst offering you European quality without the price. HDPE channel with structural ribs for anchoring and strength. Designed in accordance with European Standards EN1433 to A15 (1.5 tonne) loading. Lightweight and easy to assemble. Smooth, waterproof surface allows for quick water flow. High mechanical and chemical resistance. Accessories Pack with outlet and end caps as well as corner boxes available. For more information visit the 4ALL section of this website – Click here.